It is well known that animals and robots can sense and navigate obstacles using sensory feedback. However, while moving rapidly in a terrain with large, complex, 3-D obstacles, sensing and planning are often impossible due bandwidth limitations, and the animal or robot physically interacts with obstacles in the environment. 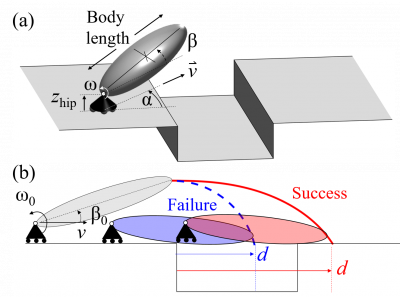 By studying rapid traversal in which there is often collision with an obstacle due to sensory feedback limitations, it is possible to discover general mechanical principles of obstacle traversal. Here, in the first of our two companion studies, we studied traversal of a large gap obstacle by a legged animal (discoid cockroach) and robot. Our observations of gap traversal showed that animal and robot behavior was remarkably similar. For both, traversal was usually successful when the animal and robot head bridged the gap and unsuccessful if the head fell into the gap prior to reaching the opposite side (see the videos below). By running at high speeds towards the gap, both the animal and robot were able to traverse a large gap up to one body length by briding with the head. Figure 1: An animal and a robot bridge across a gap. Due to the similarity between the animal and robot and our observation of gap bridging by the head, we developed a template (a fundamental general model) of the gap bridging behavior (figure 2). We approximated the animal and robot as a rigid body traveling towards the gap and falling under its own weight. By calculating the passive falling dynamics of the rigid body, we could accurately predict the maximal gap traversal distance of the animal given a set of initial conditions like approach speed towards the gap, body pitch, and body pitch angular velocity (see video below). In agreement with our animal and robot experiments, the template model also showed that using high approach speed and a pitched up body increased gap traversal performance. Therefore, we discovered that using high translational and rotational kinetic energy are general mechanical principles of gap traversal. Figure 2: The template model for gap traversal. (a) An animal or robot body is modeled as a rigid body traveling at a constant speed towards the gap. (b) Side view of model-predicted representative head trajectories traveling at a high speed (red curve) and low speed (blue curve). Inspired by the discoveries from our template model, we added an active tail to the robot to systematically pitch the robot upwards prior to reaching the gap (see video below). Our simple control strategy increased the maximal traversable gap length by 50% (figure 3). Figure 3: Adding active tail body pitch control to the robot increased performance by 50%. We are in Mech. Engineering at Johns Hopkins, and are affiliated with Laboratory for Computational Sensing and Robotics.